So, in 2017 the Syrinscape team came up with a crazy plan. Get fans who visited the Syrinscape booth at all our conferences throughout the year to all speak, together, no, not just at the same time in a messy babble, but literally in unison! ...you know, like the BORG! 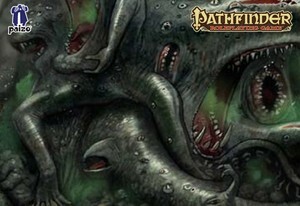 The fantastic Shoggoth that appears in the Pathfinder Bestiary I is like other Shoggoths in many ways, but Paizo's version of this beast also comes with many many mouths all babbling in horror, but also, in my imagination giving voice to "sounds and words sane life was not meant to hear". At the start of the year, we leapt on Social Media and asked fans to donate words to a script, and the result of that script, a guide track, many hours of dedication from the Syrinscape volunteers on the booth, hours and hours of audio editing AND the voices of more than 1000 fans are what you hear in this SoundSet today. This Shoggoth will bend your mind with awful messes of sound and horror, but also speak directly into your thoughts with Borg-like utterances... literally spoken from all around the world together. With dedicated OneShot buttons for each show, you can trigger horror from around the world. It's really quite lovely! We here at Syrinscape thank you for your generosity, talent and peculiarity! Together, we have built something very beautiful and 'special' in all the best ways! This SoundSet was imagined, compiled, designed, created, mixed, and finished by Benjamin Loomes of syrinscape.com, using samples created by him and also samples donated by more than 1000 attendees of Gen Con, Paizo Con, Spiel Essen, UK Games Expo, and Pax Unplugged. We here at Syrinscape thank you for your generosity, talent, and peculiarity! Together, we have built something very beautiful and 'special' in all the best ways! Kevin Cuichta Kurosch Hourfar, Amandah Peting, Greg Stockton, Ben Rabin Jamie Vandyousefi, Joseph Blomquist, Stijn Horsten, James Addink, Beth Mysliwiec, Andrew Mullen, Lyz Liddell, Landon Winkler, Agne Patricija Balcytyte, Ryan, Krzysztof Leszczynski, Tom, Robert Schneider, Daniel, Sven Bohleber, David, Jacob, Aaron, Alexander, Joseph, Nathan, Thomas, James, David, Mark, Johanna Stegink, Zachary, Anne Meuwese, Nicholas, Sascha Wolf, Patrick, noel cornils, Thomas, Stijn Horsten, Tyler, Maas Kilian Torben, Jason, Krzysztof Jablonski, Justin, Joost Kroes, Andrew, Christoph "Hammy" Stahl, Joshua, Sonja Lemke, Steven, Maximilian Riedel, Andrew, Kevin Hallescheck, Greg, Mila Ould Yahoui, Andrew, TheShadoweye, Anthony, Sebastian Kehrle, Ben, Tim Stevens, Christian, Rick, Christopher, Matthew, Michael, Simon, Daniel, David, Eric, Jeff, Jeffrey, John, Joshua, Liv Luns, Nick, Fabian Krause, Michael, Jacqueline Weigel, Michael, Sascha Simmes, Richard, Laura Opel, Rob, Jessica Kassen, Daniel, Splatter, Benjamin, Brian, Bryan, Christopher, David, Johannes "Tyroone" Schoeneich, Jessica, Eli-chan, Michael, Apollonie, Michael, Camphuysen, Adam, Frank Wesberg, David, HarryB, Kevin, Nils Block, Nathan, philip, Nicholas, Vyshez, Adam, Austin, Dylan, David Steele, Joshua, Zach Norton, Mark, Kevin Rodirugez, Michael, Kelly Amaniera, Tristan, Andy, Jason Bambalan, Blake, Chris Qualls, Bradley, kia alvarez, David, Christian Watts, David, Jonathan, Keir Mussen, Robert, Dan Reynolds, Timothy, David Cui, Travis, Matthew Ballard, Zach, Jeremy Lux, Daniel, Auralee Smith, Jason, Jay Combs, Justin, Elizabeth Martinez, Peter, Scott Barnes, Trevor, Edward Loveall, William, Zachary Muller, Andrew, liam, Benjamin, Evan Brand, Erik, amir, Ryan, Kayla Dance, Derek, Jeremy, Joseph, Joseph, Joshua, Kyle, Martin, Rebecca, Scott, Andrew Woods, Sean, Christina griffith, Thomas, Simon Dyjas, Tyler, Wendy Swart, Adam, Thomas Moore, Andrew, Brian dickens, Christopher, Mike Myler, Cody, Julia Kedge, Edward, Maeve Marko, Jay, Marissa Moore, Paul, Philip, Phillip, Ryan, Spencer, Steve, Brian, Craig, Dennis, Jennifer, John, Stefan Pahlke, John, Queen Shakeaboody, Kyle, Maren Zeiss, Kyle, Serdar Nurguen, Ryan, Mario Tewes, Sam, Sam, Sarah, Tony, Adam, Alexander, Anthony, Brad, Brian, Christopher, Christopher, James, Luke, Matt, Matthew, Paul, Ryan, Tim, Will, Alex, Alexander, Brian, Daniel, Eric, Ian, Jake, Joe, Kevin, Matt, Sean, Alex, Dan, Devin, Gabriel, Glenn, Jacob, James, John, Kevin, Luke, Mark, Nick, Richard, Stephen, Alan, Andreas, Charles, Danny, James, Joe, Mark, John Farrell, Mark, James Nygren, Mike, William Cusick, Randy, Amara Benson, Robert, anthony zagarella, Robert, Dominic Roca, Tyler, Dan Antoshak, Adrian, Rebecca Johnson, Alexander, Brandon, Brian, Chris, Daniel, Gregory, , Jack, Joel, Joel, John, Joshua, Matthew, Patrick, Steve, Steven, Alex, Anthony, Brett, Colin, Jake, James, Jay, Jeff, Jesse, Jesse, Kris, Nathaniel, Robert, Robert, Scott, Sean, Aaron, Brian, Cameron, Chris, Dan, Jason, Jeremy, John, John, Jonathan, Kenneth, Matt, Nick, Stefan, Stephanie, Taylor, Wesley, William, Andrew, Anthony, Benjamin, Chad, Connor, David, Elizabeth, Gabriel, Gary, Jacob, James, Joel, Jordan, Justin, Mathew, Matt, Matthew, Matthew, Michael, Michael, Mike, Nathan, Robert, Samuel, Juddy Frela, Sarah, Bianca Nolte-Gumz, Todd, Angelique Kuhne, Tom, Niclas Moka, Vincent, Tobias Kroeger, William, Tobias Mackert, Aaron, Florian Vetter, Aidan, Max Nothaft, Amy, Lisa Lechtenberg, Andy, Robin Nitsche, Anna, Geert Mol, Ashley, Sergey Benderskiy, Austin, , Brad, Brandon, David, Evan, Ian, Jakob, John, Justin, Kevin, Kurt, Liam, Michael, Nicholas, Roger, Sean, Sebastian, Simon, Tim, Timothy, Travis, Adam, Adam, Andrew, Chris, , Darren, Erik, James, Jason, John, Jon, Katie, Larry, Lars, Laura, Marcus, Matt, Michael, Michael, Peter, Ross, Ryan, Sara, Steven, Steven, Timothy, Tyler, Ben, Benjamin, Brendan, Casey, Chris, Chris, Christian, Connor, Corey, Daniel, David, Derrick, Emma, Eric, Garrett, Ivan, J, James, James, Jared, Jason, John, Jonathan, Josh, Kyle, Logan, Matt, Matt, Matthew, Matthew, Micah, Patrick, Paul, Roman, Seth, Ted, Alex, Alex, Andrew, Anton, Brett, Chris, Damon, Dan, Daniel, David, Dustin, Erin, Frank, Gareth, Ian, Ian, Isaac, Jacob, Jeff, John, John, Jonathan, Jonathan, Julian, Justin, Martin, Matthew, Matthew, Matthew, Michael, Michael, Mike, Nathan, Nicole, Owen, Richard, Scott, Scott, Shawn, Stefan, Tyler, Zachary, Aaron, Aaron, Anthony, Antonio, Casey, Charles, Charlie, Christian, Christian, Christopher, Dan, Doug, Elijah, Eric, Guillaume, James, Jan, Jason, Jeremy, Jesper, Jimmy, Johan, Jon, Jonathon, Josh, Karl, Keith, Kyle, Luke, Marco, Matt, Michael, Michael, Mike, Patrick, Patrick, Paul, Paul, Philip, Rory, Sam, Stephen, Terry, William, Zack, Aaron, Andrew, Andrew, Bobby, Brian, Chris, Chris, Corey, Dan, Francesco, Garrett, Hayden, , Jacob, James, Jason, Jeremy, Jim, Jonathan, Kevin, Kristopher, Matthew, Matthias, Michael, Morgan, Nic, Robert, Ryan, Alan, Anthony, Barry, Ben, Ben, Brandon, Chris, Christopher, Cory, Daniel, David, David , Derek, Donald, Doug, Dylan, Evan, Federico, Harry, James, Jamie, Jim, Joey, John, Joshua, Kelly, Kevin, Lee, Leon, Luis, , Matthew, Max, Mike, Valerio Amadei, Morgan, Kurosch Hourfar, Noah, Sander Laout, Richy Mueller. NOTE: We have lost about 150 names from our credits list. If you donated a sound but don't see your name here, contact us right now at support@syrinscape.com and we will add your name AND send you a voucher for your free access to this richest and colourful of SoundSets. Awful music by Benjamin Loomes.